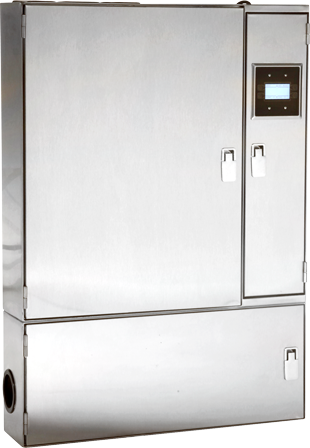 The SCS panel provides plumbing and electrical controls for Self Cleaning hoods when the design does not allow for a utility cabinet on the end of the hood. 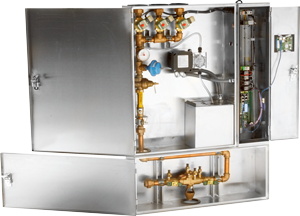 The manifold and controls are located in a remote cabinet and piped to the hood at the jobsite. The plumbing assembly includes a combination pressure/temperature gauge, shock absorber, pressure reducing valve, water solenoid valve, surfactant pump, surfactant tank, line strainer and ball valve. The SCS Control Panel includes a CAS HMI for ultimate control of the Self Cleaning operation. The HMI, located on the front of the panel, allows for user-friendly programming including multiple wash zones and programmable schedule. The SCS can be controlled with an external BMS system or through Captive-Aire's CASLink web interface. The SCS Control Panel provides starter coil control for both exhaust and supply fans and can be ordered in conjunction with an electrical control prewire that includes the motor starters. The Self Cleaning operation has two options available: Hot Water or Cold Water Mist with Hot Water Wash. The Hot Water option automatically cleans the hood plenum after the cooking operations are completed for the day. By washing the plenum while the hood is hot, wash and cleaning effectiveness increases. Surfactant will be injected into the wash for one second, every one minute of the cycle. The wash time is adjustable to meet the needs of every application. The Cold Water Mist with Hot Water Wash option immediately cools the gasses in the plenum during operation and then washing the plenum down while the hood is still hot at the end of the day. The SCS Model has been certified by ITS. This certification mark indicates that the product has been tested to and has met the minimum requirements of a widely recognized (consensus) U.S. and Canadian products safety standard, that the manufacturing site has been audited, and that the applicant has agreed to a program of periodic factory follow-up inspections to verify continued performance. Models SCS are ETL Listed under file number 101754591COL-001 and complies with UL508A Standards and CSA C22.2, No. 14-M95 and CSA C22.2, No. 73-1953 Standards.